To date, very little has been published on the topic of corrugated-steel-web bridges. fib Bulletin 77 offers the global engineering community a first complete overview of this fascinating technology. The shear capacity of corrugated-steel web began to be studied in Japan in 1965 and resulted in the use of corrugated steel in steel-girder webs as a replacement for web stiffeners. After Japan laid the groundwork for the technology, France built the first composite bridge with corrugated-steel webs and upper and lower concrete slabs in the 1980s. Composite bridges had already been popular in France but engineers found that concrete slab creep meant that prestressing force spread into the steel plates, causing high losses. Corrugated-steel web, which reduces axial stiffness, was welcomed as a solution to this problem and several bridges were designed and built with this technology. Building on France’s composite technology, Japan began developing corrugated-web precast box-girder bridges in the 1990s and today has over 140 corrugated-web bridges, by far the largest number for any country in the world. Japanese engineers have come a long way in solving issues such as fatigue and ultimate load behaviour and have made good use of corrugated-steel web’s advantages for bridge building, which include reduced self weight (of approximately 15% compared with the weight of an ordinary concrete box-girder bridge), economy and improved construction processes. 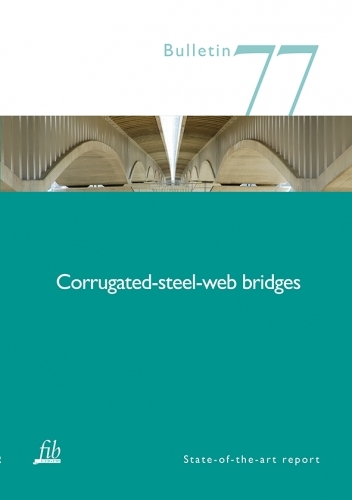 fib Bulletin 77: Corrugated-steel-web bridges covers numerous examples of bridges in Japan and France as well as an in-depth case study and analysis of a large corrugated-steel-web bridge in Germany. This publication offers designers, proprietors, contractors and architects alike relevant technical and theoretical information on construction processes along with ideas for future development.